Las Vegas attracts tourists year-round for all sorts of reasons. If you want to take a break from the normal hedonistic activities, there are many safe things to do with your dog. 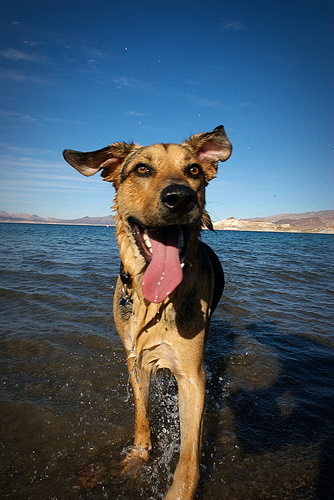 Try to avoid going to Las Vegas in the summer with your dog, as it gets way too hot! First, you’ll need to find a place to stay. Vegas can be really, really, really busy when a convention or major event comes to town, which is pretty much all of the time. It’s really important to book a room in advance if you are planning to get a hotel in a decent location, or for a decent price. Here are 2 options for finding a room – pet friendly hotels in Las Vegas and dog friendly hotels in Las Vegas. This ranch is located in the Red Rock Canyon Conservation Area, and surrounded by the cliffs of Wilson Range. It has 520 acres, and used to house German actress Vera Krupp, and millionaire Howard Hughes. There are many beautiful trails and picnic areas. Dogs can go here on leash, but not in any of the buildings. This is a historic park, located right downtown in Las Vegas. It is home to the first non-native settlers in Las Vegas, who were a group of Mormons in 1855 (how ironic!). The park has the remnants of the original adobe fort. You must pay an entrance fee, and dogs can be here on a leash, on the outside grounds. This is a nice park that has picnic tables, sports fields and a dog park. Dogs can go off-leash in the designated area, that includes benches, trees, garbage cans and water fountains. This park has sports fields, picnic areas, playgrounds and a dog park. Dogs can be off-leash at the designated area, which has trees, shade shelters, benches, trash cans, garbage cans and water taps. This area is located in Boulder City, Nevada, 25 miles from Las Vegas and has 1.5 million acres. If you go up to the lake, make sure to bring food to feed the fish, as there are millions of them and they go crazy! Dogs are allowed on leash, and you can hike around the lake. This is a Mexican restaurant that has locations all over Las Vegas and surrounding areas. They have fresh ingredients, and all sorts of Mexican specialties like burritos, tacos and enchiladas. Dogs can be at the outdoor tables. This is a bar with a great beer selection, but not as much food. It has live music Friday and Saturday nights. Dogs can be at the outdoor tables. This is a deli that has American food and sandwiches, as well as pizza. Dogs are allowed at outdoor tables.